"Move over Jak & Daxter for Ratchet & Clank are the new arcade heroes of 2002!" Ratchet & Clank is a classic 3D arcade game that offers gamers a bevy of features that will even keep the most seasoned gamer satisfied. 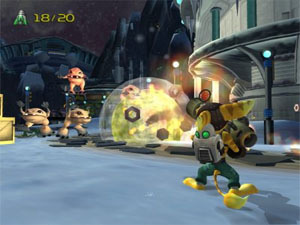 Ratchet & Clank is about a young mechanic named Ratchet who dreams of exploring other worlds in search for adventure. Little does Ratchet know that his once peaceful world is about to be overturned and as the old saying goes.... "be careful what you wish for". On another planet known as Belchworld, the inhabits of the planet called the Blarg have decided to modify their disgustingly polluted planet by stealing parts of other planets in order to make theirs a Utopia. Unfortunately for the Blarg, one of their factories manufacturing these robots to steal other worlds has developed a very strange glitch. This robot, Clank has been given a conscience and intends to stop the Blarg's insidious scheme. Chased by an army of Blarg, Clank meets the unlikely hero called Ratchet who together they team up for a riot filled arcade adventure filled with comedy and heroics. Ratchet & Clank is not your average 3D arcade game and features a variety of features that will ensure that this game does not become boring. Unlike other arcade games that have a linear storyline, Ratchet & Clank lets you solve all the puzzles in the order you like with just a little nudge from the storyline itself. The gaming environment of Ratchet & Clank is huge and features some extraordinary graphics, gadgets, weapons, storyline and awesome gameplay. The gameplay in essence is a scavenger game with set goals, that is, you must find various items and characters in the game to proceed to other areas. When you defeat an enemy, they explode into dozens of little pieces of nuts and bolts. These nuts and bolts are used as currency in the game and allows you to buy a variety of different items such as weapons, ammo or upgrades for Clank like helipads and thrusterpacks. The control system of Ratchet & Clank is extremely easy to pickup and you must use the right analog stick to control the characters while the other stick lets you control the camera angle. The camera angle is sometimes a little slow to respond but that's the only grip I can find in this game. The developers have done an extraordinary job of making the combat in the game quite unique. 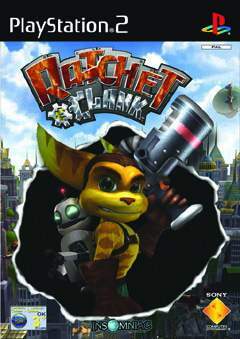 That is, Ratchet can perform a variety of different moves such as using his ratchet to hit enemies, a power jump that lets the ratchet be used as a sledge hammer or access to a variety of different weapons such as cannons and sniper rifles. For example, you can use your blaster to dispatch a wide variety of enemy units or you can discretely snipe them away. Fortunately the game isn't that difficult when it comes to enemy units. Sure, if you get overwhelmed by fire sharks, its a quick way to die but if you think about it and take your time when deciding how to take on an enemy, you will always come off first. 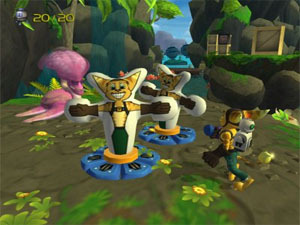 All the items in the game, whether non-combat or combat must be used in the game at one point. Sometimes you might need your slingshot to cross dangerous caverns or you need your trespasser to enter locked areas in the game, everything comes together flawlessly. You can save the game anywhere in the game but this just saves the start of the level, fortunately there are many check points in the levels that ensure that your frustration level is kept at a minimum. Both Ratchet and Clank have unlimited lives and it's good to see that the developers have implemented this feature. As mentioned earlier, the gaming environment of Ratchet & Clank is huge and on some levels it's quite easy to get lost but fortunately the storyline and the various secrets in the game is enough to keep you very interested. The game contains over 18 different worlds you can visit and all these worlds are uniquely different from the other. Graphically Ratchet & Clank is an extremely good looking game and features some of the best backgrounds I have ever seen. The draw distance in the game is tremendous and you will not see any popup or slowdown in this game, ever. There is so much moving around on screen at once that there are times when you just want to stop and look around and marvel at the world of Ratchet & Clank. 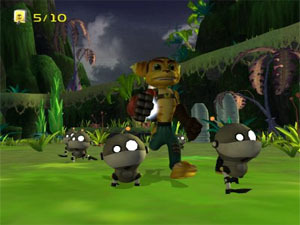 All the characters have this 3D animated look to them, although simple look fantastic on the PlayStation 2. Ratchet & Clank has some great cutscenes that use the ingame engine and look straight out of a Saturday morning cartoon, these cutscenes are usually quite humours too. The Sound of Ratchet & Clank is perfect and features a nice blend of background ambience with a witty and interesting soundtrack. All the characters have some great voice acting, even though many of it does sound cheesy, that's what this game is all about it. Clank is basically Ratchet's straight man. It's been a good year for the PlayStation 2 and just when you thought things couldn't get any better, along comes Ratchet & Clank. This is probably one of the most fun arcade games I have played since Klonoa and Jak & Daxter. With smooth awesome graphics, perfect gameplay and a great storyline, Ratchet & Clank is a must own game for the PlayStation 2. Highly Recommended!